Simon Snow just wants to relax and savour his last year at the Watford School of Magicks, but no one will let him. His girlfriend broke up with him, his best friend is a pest and his mentor keeps trying to hide him away in the mountains where maybe he’ll be safe. Simon can’t even enjoy the fact that his room-mate and longtime nemesis is missing, because he can’t stop worrying about the evil git. Plus there are ghosts. And vampires. And actual evil things trying to shut Simon down. When you’re the most powerful magician the world has ever known, you never get to relax and savour anything. Based on the characters Simon and Baz who featured in Rainbow Rowell’s bestselling novel Fangirl, Carry On is a ghost story, a love story, a mystery and a melodrama. It has just as much kissing and talking as you’d expect from a Rainbow Rowell story - but far, far more monsters. A Harry Potter-esque romantic adventure story set in a boarding school from Rainbow Rowell? Yes please, thank you very much. Taking its cue from the ‘chosen one’ trope of fantasy stories, Carry On’s orphaned Simon Stone has been plucked from obscurity thanks to a prophecy. Not everyone is too happy about this event, especially not his roommate/arch nemesis Baz. Rowell has always written teenagers – their fears and dreams, their romantic entanglements – with skill. Her portrayal of them is sharp, sometimes ironic, but never without empathy. Carry On has so much heart to it that it’s almost a tangible presence in the book itself. The Harry Potter fan will find many, many references in Rowell’s world and characters, from Baz’s Draco-like sneer to Simon’s untenable Potter-like hair, but these references are thankfully not cut-out parodies; they’re smart, frequently funny and feel incredibly contemporary. 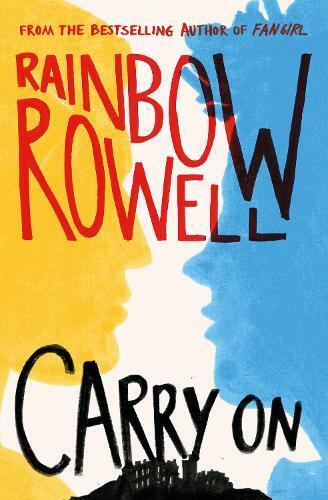 This book also taps in to how YA fiction has changed throughout the years and for those of us familiar with the canon, Carry On is a self-aware, transformative work. Yet, Rowell’s full-bodied characters and ability to track the familiar down unfamiliar paths also ensures that this novel confidently exists as a standalone work. Carry On is the book I loved reading the most all year. Bronte Coates is the digital content coordinator for Readings.